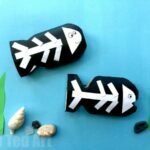 You may have spotted our Black Glue & Watercolor Art Projects earlier this week. 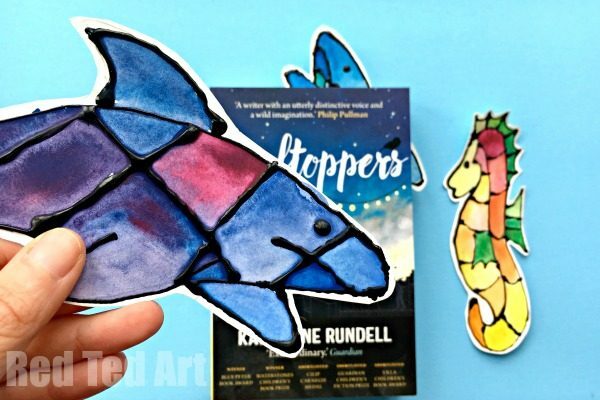 We had such fun creating our own Shark Black Glue Art and loved seeing all the contributions from our fellow Black Glue Artists, that we had ANOTHER go at Black Glue and Watercolor Art and turned our shark and I Heart Crafty Things’ seahorses into super simple and colourful BOOKMARKS. 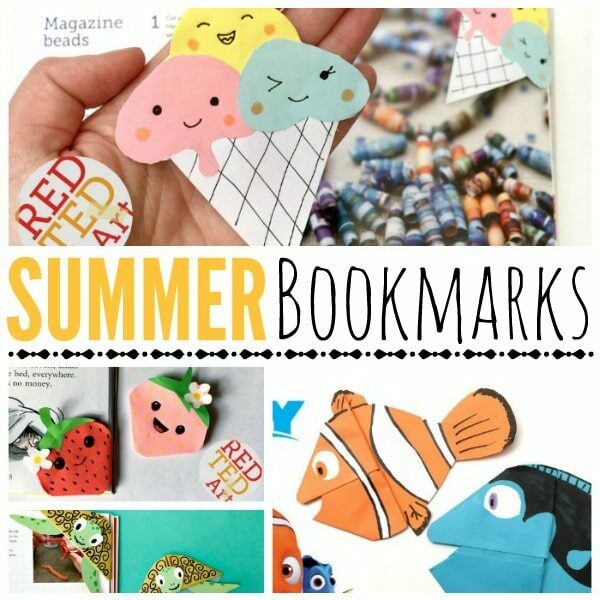 Perfect Ocean Bookmark Ideas for the summer holidays – don’t they go fabulously with the rest of our Summer Bookmarks Ideas?! 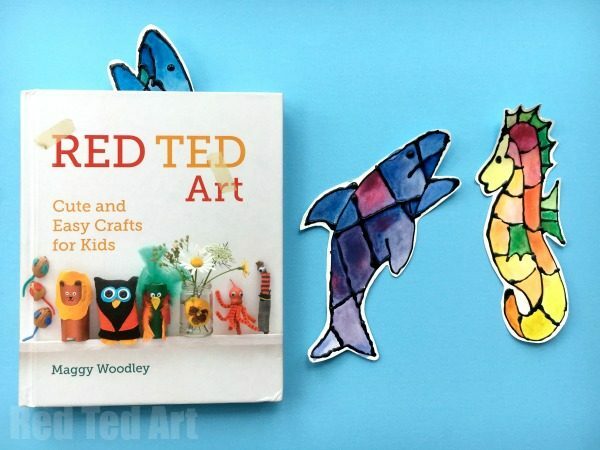 We love how both the shark and the seahorse turned out and what fabulous Shark Bookmarks and Seahorse Bookmarks they make. 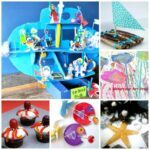 A great “practical” Art Project for Summer (if you love art.. and fancy more art inspiration.. check out our Easy Wreck This Journal Ideas and inspiration too!). You can either hand draw your own designs OR use our handy downloadable printables. You can get the Shark Bookmark Template here (be sure to set the printer settings to “2 per page” or “half page size”, esle you will have a rather LARGE Shark! Teehee). 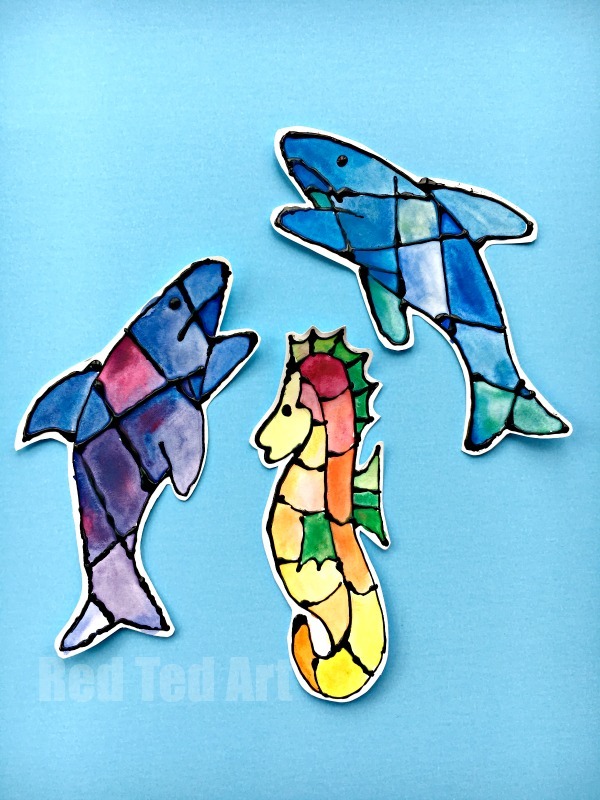 And you can find the Seahorse Bookmark Template here. Now, I did mean to take some step by step photos, but I rather got carried away in the moment ( I did do a “life” video of work in progress)… so you can either watch the Video How To, or follow the simple written instructions below! 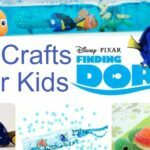 It doesn’t have as many step by step photos as I would like, but I think as the project is relatively straight forward the Ocean Bookmark Ideas instructions should be fine as they are. Start by printing out your templates. As mentioned the “single shark” template, needs to be printed either in “half scale” or two per page to make a nice bookmark size. The Seahorses come as a set of four bookmarks already. 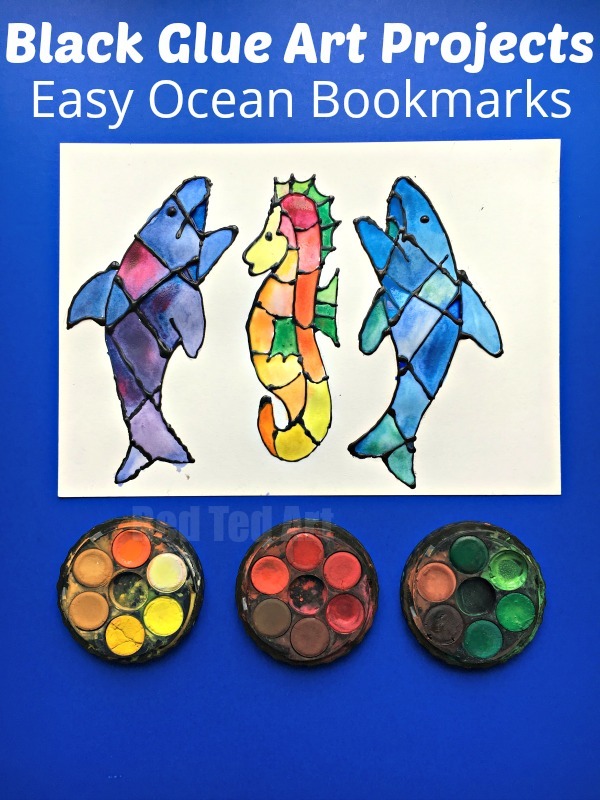 Alternatively you can do your own Ocean Bookmark designs and draw free hand. I show how to draw a shark in this video here. 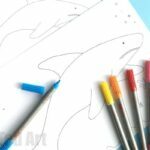 Cut our your shark bookmark template and seahorse bookmark template and trace. Fill in the details by hand. Add any additional divisions. We made our shark to look like a black glue stained glass projects by adding some criss cross lines. Next get your black glue – make sure the nozzle is nice and clean. Shake the glue to make sure it is near the nozzle end and with no air bubbles… and do a little test strip. We find that the faster and smoother you make your line the better. Don’t worry too much about following your drawing 100% you can rub out any pencil lines – though I tend to leave them in place, I like the way they look. 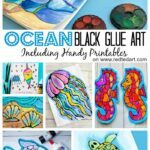 Once you have created all your black glue outlines to your shark bookmark design and you seahorse bookmark design, let dry fully!!! 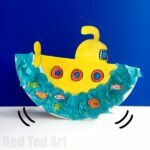 If you wish you can then rub out any pencil lines, but I find it best to leave them! Now you can get your watercolours out. Remember wet paper makes the colours spread beautifully. Experiment with blending colours. 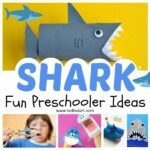 We did a “Blue and Red” Shark Bookmark and a “Blue and Green” Shark Bookmark. 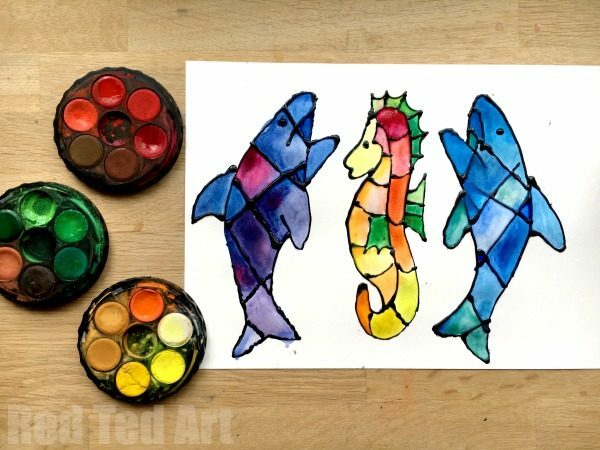 And chose a mix of colours for the Seahorse Bookmarks. Just have fun. Again, let your DIY Ocean Bookmarks dry fully. You can now take Black Glue and watercolour bookmarks and cut out your shapes. I like to leave a little white rim. And your beautiful Ocean Bookmark Ideas are finished? 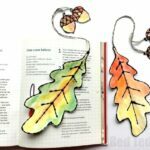 Don’t they make simply fabulous Summer Bookmarks? Just gorgeous. 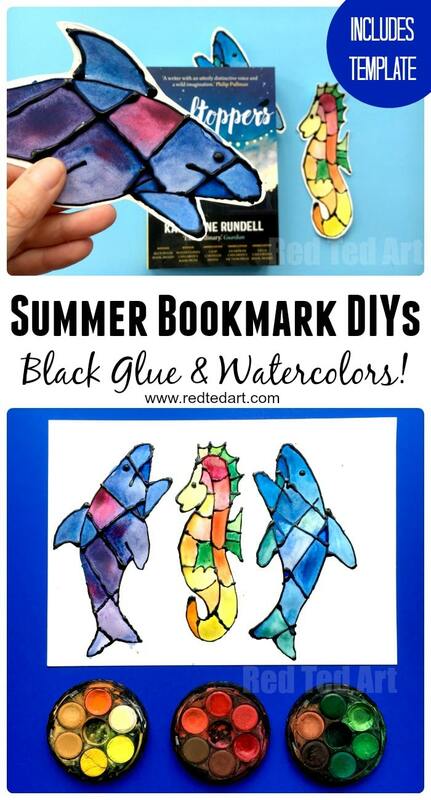 Have fun making your own Shark and Seahorse Ocean Bookmarks this summer!